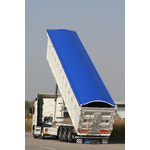 Leading European Company in the production and sale of patented tarpaulin systems for industrial vehicles. The patented CRAMARO tarpaulin systems are operated from the ground, the electric versions even remotely. Covering and uncovering became faster and safer since the operator no longer has to climb up to the load level. Coverage of the load improves the aerodynamics and results in a considerable saving of fuel, about 2 liters per 100 km, contributing to the economy of operation of the vehicle and favouring the environment. More security, increased productivity, savings and the environment. The ideal solution for road transport!